The top grossing charts in mobile gaming right now may look awfully similar to those of January 2015, but that doesn't mean the industry hasn't been changing beneath the surface. 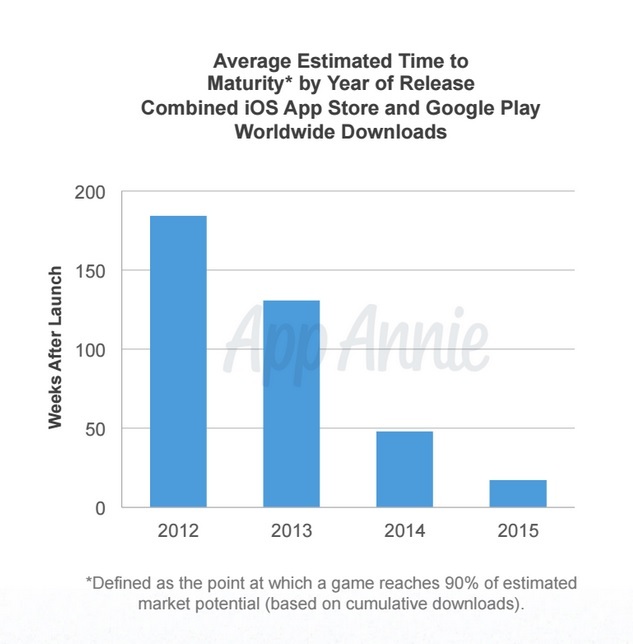 App Annie today released its 2015 Retrospective report, underscoring a handful of significant shifts in the industry. The first trend App Annie highlighted was that as the mobile game industry matures, the lifespan of individual games is shrinking. As a result, publishers need their games to reach success on a quicker timeline. "This naturally impacts marketing and monetization strategies as publishers seek high visibility and engagement upon release. It also has significant ramifications for portfolio management, with most publishers requiring more frequent releases to maintain the momentum that may have been sustained by a single title in previous years." The other trend noted in the report is that the top publishers are collectively making up a smaller proportion of the industry as a whole. So even if the same names are dominating the charts, revenues for publishers beneath that top tier are growing. "Taken together, these trends paint an interesting picture of the mobile gaming market," the report said. "On the one hand, smaller publishers have taken up a greater slice of the market. On the other, the prospect of long-term success with just one or two games continued to become less realistic for most publishers. "With a timeframe of roughly four months after launch until downloads start to dry up, fast development cycles and continued innovation are necessary to see success in an increasingly less concentrated and higher tempoed space. Increased marketing spend, press and public interest are likely to drive shorter maturity cycles still, while rising competition is likely to further fragment the revenue concentration in mobile games." The report also included the firm's recap of the mobile industry beyond games. Just as with gaming, the mobile trends showed leadership in the market staying the same, while the underlying trends suggested larger shifts in the works. Apple's iOS continued to grow revenues at a faster rate than Google Play, but the Android maker's app store doubled its rival in worldwide downloads. "This massive disparity could mark the beginning of major changes in mobile marketing, including substantial increases of Android's share of mobile ad spend," the report noted. In the US specifically, Google Play downloads outnumbered those of the iOS App Store for the first time. Worldwide, Google Play growth was attributed to emerging markets Brazil, India, Indonesia, Turkey, and Mexico. As for iOS, apple saw App Store revenue growth propelled by China, the US, and Japan. I'm not surprised, the number of new releases is growing far faster than their audience, and unless you are a large studio/publisher with lots of resources you have an increasingly short window of "free" new game publicity and then you get buried under the next wave of new games. I would love to see this chart split out by studio/publisher size, because I would expect the trend is actually the opposite for large studios/publishers, who first have to be very careful about when they start pouring fuel (aka ad money) on a game and then, if that money yields a positive ROI/ROAS, subsequent ad spend and continued development investments. I agree, Casey. A game's peak of cumulative downloads is going to vary greatly by whether or not there are marketing dollars behind it. And I'm curious how the difference between games with/without marketing support would impact these numbers... one one hand, MOST games don't spend money to acquire users, so you could assume these numbers reflect just them. But maybe games with marketing dollars are the ones spending less time to allow a game to peak, while everyone else is the same, which would change the story quite a bit. I'm curious! Rather full circle as I see it. The mobile market burst wide open as the industry railed against the go big or go home nature of the home console market and yet now we see that same trend hitting mobile itself. Actually the number of new games per day has decreased by 50% from 350 per day to 180 per day, roughly. These at least are the latest figures given at MGF in Rovio's keynote yesterday. This report is very vague. They don't go into details, like what type of games are they talking about (genre, type, category etc..). What is trending ? Freemium games need to be released more often ? or premium ? If both, than what are the categories affected ? Rpg ? Action ? Puzzle ? Runner? Match 3 ? Sim ? etc. Also what are the trends in user engagement, what's on the rise and what's on the fall, what is stagnating: casual ? mid-core ? hard-core ?